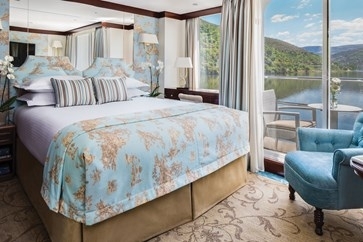 10 night cruise sailing from Lisbon aboard the Queen Isabel. 7 night cruise sailing from Porto aboard the Queen Isabel. 12 night cruise sailing from Lisbon aboard the Queen Isabel. 12 night cruise sailing from Madrid aboard the Queen Isabel. Beautifully appointed riverview Category 1 (215 sq ft - 20 sq m)have full balconies, hotel beds draped in fine linens with choice of pillows, built-in closets, hair dryer, safe, individual thermostat, flat-screen television, radio, alarm clock, iPhone/iPod charger and player, bottled water daily. Bathrooms with L'Occitane en Provence bath and body products, plush towels, a choice of bathrobes, and slippers.